This South India tour is brimming with variety and many extraordinary gems for you to enjoy. Relax on the beach, wander colonial streets or simply savor the historic architecture – the choice is yours! Mamallapuram was once a bustling seaport that provided shelter to illustrious travelers like Ptolemy and Periplus in the first century! 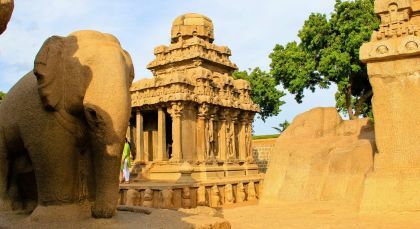 Today, the city’s claim to fame lies in its ancient Pallava heritage, evident in Mamallapuram’s exquisite collection of temples, caves, rathas (chariots) and monuments. Unearth several UNESCO World Heritage Sites. 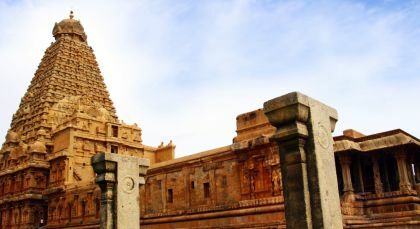 Tour the stunning two-towered 8th century Shore Temples, dedicated to Lord Shiva and built in the typical architectural style of the Pallava dynasty, who ruled South India for three centuries. With the temple’s oceanic backdrop, this is especially beautiful at sunrise and sunset. Explore Arjuna’s Penance, a gigantic 7th century relief carving, depicting the legend of the holy River Ganges,or the Anantasayana Panel, which shows a reclining Vishnu, and Varaha Cave. Head to the Pancha Pandava Rathas (Five Rathas or chariots). These 7th century architectural monuments were hidden under sand until 200 years ago and are intricately carved out of a single large rock. Observe the mysteriously balancing rock of Krishna’s Butterball. Unwind with a leisurely amble along the town’s sandy shores. A half day tour of Dakshinachitra takes you to the living museum which provides insight into the architecture, lifestyles, crafts and performing arts of South India. Tour the 10 acre campus which has been recreated to depict 4 South Indian states – Kerala, Tamil Nadu, Karnataka and Andhra Pradesh. Explore heritage houses, interact with village artisans, witness folk performances and participate in activities like bead making, basket weaving, pottery, palm leaf carving, paper craft, shell craft and glass painting. Pondicherry offers a slice of France in South India! Once a sleepy fishing village, the trading town was a French settlement since the 17th century until the Indian Independence. Revel in the fusion Indo-French culture of this quaint French town, best explored by foot. 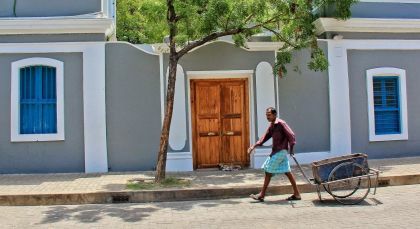 Amble leisurely through cobbled streets to discover stunning boutique shops brimming with handmade, contemporary crafts, and a proud café culture, tucked within grand colonial and Tamilian buildings. In the Tamilian side of town, you can visit the living Manakula Vinayagar Temple. Wander through the famous Aurobindo Ashram, a spiritual community that follow the teachings of Sri Aurobindo, and the resting place of The Mother, Sri Aurobindo’s spiritual collaborator. Venture to the town’s outskirts and visit Auroville, a universal community that is heavily involved in sustainable and alternative living projects. Kindly note that Auroville is closed every Sunday afternoon. En route to Pondicherry, stop off at the holy city of Kanchipuram and visit the ancient Vedapureeswarar Temple and Varadharaja Perumal Temple. Enjoy temple tours and historical ruins! 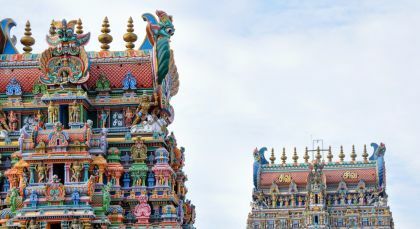 Discover some of the most beautiful temples of South India during your day tour of Pondicherry. Visit Chidambaram Thillai Nataraja Temple, which was built by the Chola dynasty to honour the Hindu god Shiva in the form of Nataraja – the Lord of Dance. Travel to Gangaikonda Cholapuram, the city of the Chola who allegedly conquered River Gange, and was once the beautiful capital of this powerful kingdom. Explore the magnificent three storey high Gangaikonda Cholapuram Temple, which is surrounded by a massive fort-like wall and affords plenty of amazing photo opportunities. Thanjavur is a fascinating cultural melting point and was once considered India’s cultural capital. Delight in the traditions and talents of Thanjavur, beginning with the famous UNESCO World Heritage Site of Brihadeeswarar Temple, a thousand year old temple dedicated to Hindu God Shiva and home to India’s largest lingam (a phallic symbol of fertility). Venture onwards to another temple in Shiva’s honour, the Panchanatheesvarar Temple. Kindly note that footwear is not permitted within the temples. Visit the home of an artisan within his community and watch how he handcrafts the incredible brass sculptures that the city is famous for. Learn how the intricate and foiled famous Tanjore paintings are crafted. Madurai, the city of incense and chiming cymbals, is one of the oldest in India! Dubbed the “Athens of the East’, the historical city was reputedly visited by learned men from Rome and Greece, including Megasthenes in the 3rd century BC! Cozily nestled amidst the towering mountains, this is an energetic city of contrasts where Hindu Gods and a growing IT industry go hand in hand. 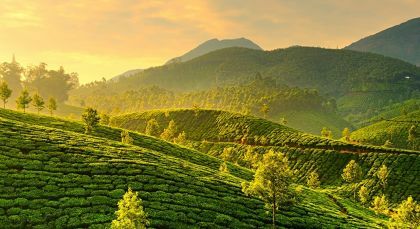 Munnar offers a haven of peace and tranquility within the verdant hills of Kerala. Explore this beautiful panoramic town. Drive to Matupetty Dam and Kundala Dam; visit Echo Point via sprawling tea plantations; end at Top Station to view lush mountainsides. Dine in the city; stay overnight. Next day, enjoy a drive through winding lanes, a picture-perfect town and scenic plantations; see exotic forest and grassland flora. Do a 20 min trek to the top on a paved path. Back in the city, visit the Kannan Devan Tea Museum..housing photographs and machinery depicting each turning point contributing to a flourishing tea industry; the Antiques museum exhibits antique furniture, Telephones, etc, and shows a 30 min documentary on the history of Munnar along with a tea production demonstration; take a Tea Tour in the evening. 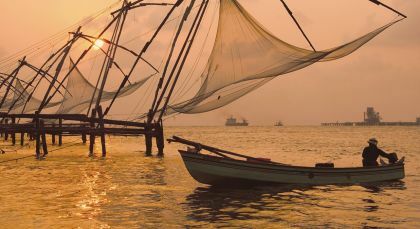 Kochi, formerly Cochin, is considered the Queen of the Arabian Sea as it was one of the first European settlements in India, due its ideal positioning for trading. 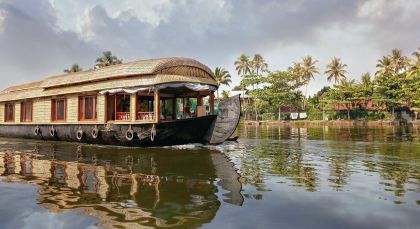 Cruise Kerala’s backwaters and stay overnight in a traditional kettuvallom, a boat made from coconut rope and wooden blanks. 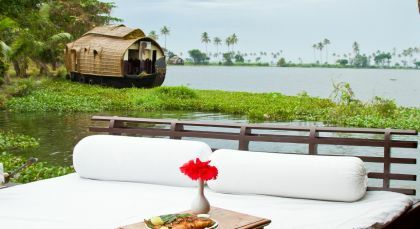 Alleppey was once dubbed the Venice of the East by the visiting former Viceroy of India, Lord Curzon. When staying at Marari Beach Resort you can begin your blissful day with a wonderful optional open air yoga class, and by enjoying a delicious and leisurely breakfast. Observe and learn about the varied and beautiful species of butterflies at the on-site Butterfly Garden, or take an environmental tour of the property and witness the biogas and sewage plant, and solar energy systems. Venture to the Kitchen Garden to see where the fresh, native ingredients for your meals are grown, and feast on a Keralan culinary demonstration by the chef in the Farm Kitchen. Visit the Ayurveda Center for some pampering. You can also enjoy an escorted stroll through nearby villages, or learn how to attire yourself in a fun hands-on traditional Indian sari/dhoti demonstration. My family visited India recently to see where my parents lived in the 1960’s, on a tea estate near Ooty, where I was born. My brother and sister came as well. We had a very enjoyable and memorable trip that was so well organised by Enchanting Travels. Everything went according to plan and there were no unexpected problems. The hotels were excellent, the tours interesting, the guides very informative and our driver Sashi was amazing. He was friendly, polite and navigated the crazy traffic with cool calm dexterity. The convenience of our own vehicle and driver made it possible to stop whenever we wanted, and to adapt the trip to suit our wishes. 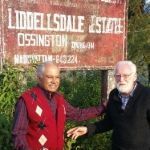 When we got to the tea country we were able to find the tea estates and met people who remembered my parents. We visited the bungalows where we lived and saw people picking and collecting the tea. It was a real trip down memory lane for my parents and great for us to see the places they have told us about. Later we stayed on a houseboat on the backwaters of Kerala and had three wonderful days where my parents also celebrated their 55th wedding anniversary. The houseboats are like a floating hotel room moving slowly through the waterways. The crew and captain were very friendly and helpful, and the food was delicious. We were very glad to have made this special trip together, and lucky to have found Enchanting Travels to arrange it all for us.